The Lowell Devils, known as the Lowell Lock Monster from 1998 to 2006, were an ice hockey team in the American Hockey League (AHL). 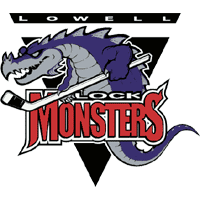 In 2006, the Lowell Lock Monsters were purchased by the New Jersey Devils and given the name the Lowell Devils. In 2010, the Lowell Devils moved from Tsongas Center in Lowell, Massachusetts to Times Union Center in Albany, New York. Since the AHL season of 2010-2011 the team has been using the name Albany Devils. The Lowell Devils' hockey season season took place from September throughout April. The Lowell Devils averaged 2 293 fans per game during the AHL season of 2008-2009. The Lowell Devils has been awarded with the AHL Excellence Award for the Eastern Conference for group sales (2008/2009). The team's last season as the Lowell Devils was 2009-2010. During this season, the team made the Calder Cup playoffs. The members of the team were renowned for volunteering time and funding to projects in the local community. The local fan club was called Lowell Devils Booster Club (LDBC) and they attended every home game and arranged trips to hockey matches in other towns. In February, 2010, the University of Massachusetts Lowell took ownership of Tsongas Center, the traditional home arena of the Lowell Devils. Up until the, the arena had been owned by the City of Lowell. Since the current lease would expire at the end of the 2009-2010 season, the University of Massachusetts Lowell and the Lowell Devils entered into negotiations for a lease extension. No agreement was reached and in June, 2010 the New Jersey Devils – owner of the Lowell Devils – announced that the Time Union Center in Albany, New York was to be new home arena for the Lowell Devils. Since the 2010-2011 season of the American Hockey League (AHL), the team has been using the new name Albany Devils instead of Lowell Devils.